Still we all like to meet and most business takes place in the physical world and until recent years the physical tracks were invisible. But adding proximity data you have the chance to get the full picture of the customer journey as you will be able to combine the digital tracks with the physical ones. Proximity data is growing rapidly and proximity media is relevant in many businesses. Continue reading to find out more! The number of beacons globally are now more than 10,3 millions, an increase with 7 millions since 2015. Beacons play an important role when it comes to generating big data. Send relevant, engaging content to a consumer´s mobile as she is getting close to a beacon or use the proximity data to create retargeting campaigns. Our solution can easily be integrated with your email, campaign management or marketing automation system to create super effective omni channel campaigns. An iBeacons sends a signal with very specific proximity data. Smart phones are constantly listening for these signals and the phone will be able react on the signal with a predefined action. The app can present a personalised message based on the specific user profile and/or a certain micro-location. The message can be sent as a push notification or show directly in the app or on digital screens. The app will send customer data back to the cloud solution. The specific message or campaign information is managed in the ShopJoy platform and the location data is stored for future usage. With this platform you can reach your audience at specific times and/or at specific sites. With sensors and smart phones we connect the physical and digital world. lets gather more proximity data together! 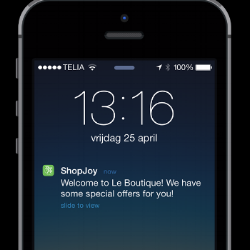 Media owners: With iBeacons the message will get a higher reach as it is sent to the audience mobile. Location/site owners: Engage your visitors at destinations such as malls, areas within the city, arenas and events. You can for instance create your own proximity gamification solution! Brands: Engage your customers on the mobile when they are idle. All communication bureaus: Increase the campaign ROI by adding proximity data to the customer profiles. Businesses: Integrate your intranet with our platform and your co-workers will get news and information based on where they physically are. Like to learn more? Book a meeting, we love to learn to know you!